We owe many iconic images of American Indians to photographer Edward S. Curtis. Growing up in Wisconsin and Minnesota, Curtis began photographing Indians in 1895 and, in 1906, was offered $75,000 by JP Morgan to continue documenting their lives (wikipedia). The 1,500 resulting photographs inevitably impacted the image of Indians in the American imagination. Later it came to light that Curtis’ photographs weren’t exactly pure representations. In some photographs, for example, he erased signs of modernity. The first photograph below, the un-edited version, includes a clock between the two men, whereas the edited version does not. 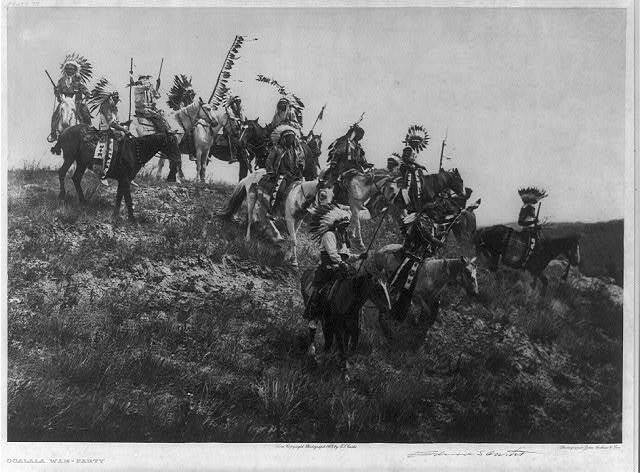 In Curtis’ picture, Oglala War-Party, the image shows 10 Oglala men wearing feather headdresses, on horseback riding down hill. The photo caption reads, “a group of Sioux warriors as they appeared in the days of inter tribal warfare, carefully making their way down a hillside in the vicinity of the enemy’s camp.” In truth headdresses would have only been worn during special occasions and, in some tribes, only by the chief of the tribe. The photograph was taken in 1907 when natives had been relegated onto reservations and warring between tribes had ended. Curtis paid natives to pose as warriors at a time when they lived with little dignity, rights, and freedoms. Curtis’ photographs, then, pushed his subjects back into a false past that non-Indian Americans would misrecognize as authentic for a hundred years. The problem of misrepresentation of groups who have little power to control their own images is a widespread one. Shelby Lee Adams’ work was mired in controversy, with critics suggesting that he contributed to the belief that Appalachians were backward, imbred, and unintelligent. We might apply the same critical eye to representations of marginalized peoples today, like the representation of Arabs in video games and Italian-Americans on Jersey Shore and spin-offs. Thanks to Dolores R. and Adrienne at Native Appropriations for the post idea. I wonder if Curtis' work erasing the clock is one of the earliest instances of what is now known as Photoshopping? Also: My family owns several original Curtis photographs, which are proudly matted, framed, and displayed. This is the absolute first I've ever heard of this, which may very well be due to me never fully researching the artist, as I grew up with them on the walls. I'm saddened by this news, although not really surprised. I still think they're beautiful, and as a photographer, I understand Curtis' motivations. But as a critical consumer of media, I can't support them - I see this kind of misrepresentation echoed everywhere in popular culture. "Primitive"? yes, I know the headline put quotes around the word to describe Indigenous Americans. If anything, the Europeans were the primitive ones, having brought diseases, guns, and forcing Christianity down the Indigenous peoples' throats. Anyway, the moderator for the popular Facebook page "Native Amerian Indian-Old Photos" also noted that many of the old photos representing Indigenous people were not authentic, that they were staged as well. So this news hardly surprise me. Now I'm wondering how much of the regalia and iconography in the Star Wars mythos was appropriated from Native cultures. I'm somewhat bemused by the "surprise" being voiced about "staged" photographs. Before the development of fast film, every photograph was "staged." Yes, definitely staged. But assumed by so many to be authentic. They're used a lot in children's literature. A lot of Native people, however, are glad for the photos themselves. They see beyond the staged aspects, and gaze at photos of family members. Though Curtis didn't bother to provide names for the individuals, their names are not unknown. As such, his goal (to record "authentic" Indians) was a failure, but the photos themselves mean a lot to a lot of Native families. "Curtis didn’t bother to provide names for the individuals, their names are not unknown." is incorrect. The individual portraits are named. That these historic photographs 'cannot be supported' because they don't conform to very recent norms of 'political correctness' is absurd, at best. Reminds me of an old quote about paintings, but to be more accurate a metaphor of the 'big picture' which I'll paraphrase, thusly: "if one stands too close, all one sees are smudges and imperfections. If one stands too far away, one misses the details." "In 1906 J.P. Morgan offered Curtis $75,000 to produce a series on the North American Indian. It was to be in 20 volumes with 1,500 photographs. Morgan was to receive 25 sets and 500 original prints as his method of repayment. 222 complete sets were eventually published. Curtis' goal was not just to photograph, but to document, as much American Indian (Native American) traditional life as possible before that way of life disappeared." Clearly - clearly - Curtis had a dual purpose; photographing (which larrycwilson has pointed out in the best possible way) and documenting Natives, one of which is an artistic endeavor which, again, as Larry pointed out requires 'staging' among other embellishments and the other being a more sober academic approach. The photos in this article show that Curtis accomplished both of his directives. There is no discrepancy here if one uses his or her imagination. Take the photo of the men with the clock. This photo can go both ways: removing the clock is an artistic representation meant to convey what life was like for Natives before the clock; leave the clock in and you show two Natives contemporary for the times. Curtis, by removing the clock, attempted to place the two subjects in the past. Put yourself in the place of a viewer of these photographs at the time, perhaps even as one that has never interacted with American Indians; could you imagine life without the clock? That's what makes the photo - and the subject - interesting. It compels the viewer to consider the context of past, present, and future. With the clock it's two Native men sitting there with a clock. Everyone had a clock. See where I'm going with this? Each photo has an appropriate context. 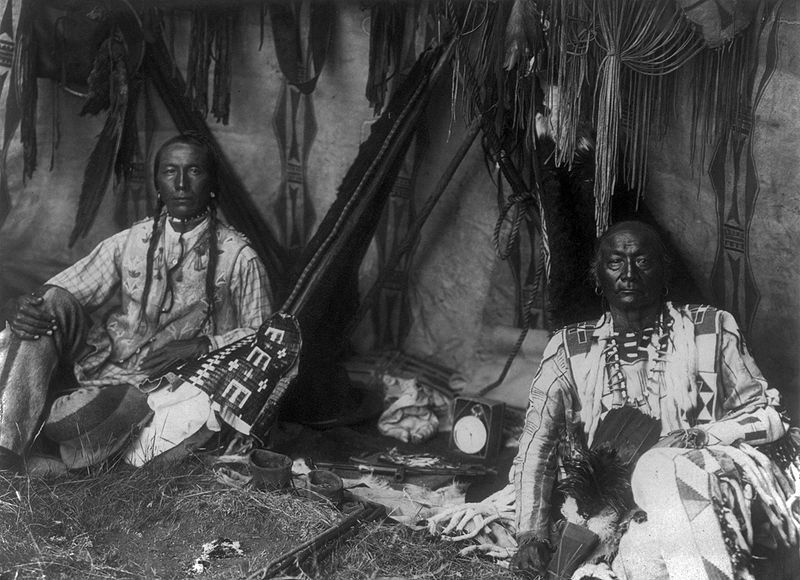 Now, let's take an appropriately distanced look at the Oglala War-Party photo. I agree wholeheartedly as anyone would that this photo is a cultural misrepresentation. However, we must consider Curtis' motivation for said misrepresentation. Was it borne of malice (i. e. a determination to make the subjects 'look bad?') or was it borne of ignorance? Even today it is a common misunderstanding that all Plains warriors wore headdresses. Is Curtis' photo solely to blame for this? No. Could people at the time have had the same ignorance of this detail? Oh yes. The point is, the line on this one is blurred. As per the description, Curtis' motivation was to stage a historically accurate representation of an Oglala war-party. This clearly falls out of the realm of documenting the everyday lives of the Natives, since tribal warfare had ceased. Therefore, he took artistic license, yes, and to call these photographs shameful is in error; the assumption that Curtis wanted to perpetuate misrepresentations of Natives is unfathomable. Let us instead consider the possibility that he wanted to capture the public imagination, as I have posited above about the clock photo. If I am correct that the public at the time had the same misconception today about details of cultural costume or what have you even before Curtis' photographs contributed to said misconception (not an unfair assumption, given cultural attitudes at the time which we would now call ignorant and oft malicious), then we can assume just as easily that Curtis wanted to create a scene that would intrigue the viewer and cause them pause for thought. If you doubt this - look what we are doing now. Addendum: I must also say that in choosing to take artistic license with the 'War-Party' photo Curtis obviously failed in creating a historically accurate representation. His description, therefore, was a shenanigan that would have better served history by being expunged. I just read about another anthropologist who did similar work. "Smithsonia anthroplogist Robert Shulfeldt (...) classified the "Indian types of beauty" in North America in an illustrated 1891 publication. The women he considered most beautiful were posed as Victorian ladies sitting for their photographic portrait. In contrast, the camera rendere those he classes unattractive in the visual idiom of ethnography: half-naked bodies, direct stare, and frontal pose." I'm surprised that no one has taken issue with the assertation (at the end of this entry) that Italian-Americans are among the "marginalized peoples." Yes, I would have included them in that category throughout at least the first half of the 20th century . . . but today? _Jersey Shore_ is a travesty, and _The Sopranos_ was sensationalist and misleading, yes. But do such depictions mean that Italian-Americans today are marginalized in the same way that Native Americans were and are? I'm just not seeing it. I for one am appalled that a PhD recipient would submit an article in any forum, especially on a topic as important to the public as this, and only cite Wikipedia and articles within the same blog. Having worked for several months in the National Anthropological Archives, in direct relation to a project attempting to update many of Curtis' negatives, I knew that there were other, researched, reliable resources that discussed the topic discussed in this article. A google search of Edward Curtis turned up, not Wikipedia first, but the library of congress online exhibit related to Edward Curtis. It includes a very comprehensive article on Curtis and the "myth of the 'Vanishing Race'" (Including a bibliography citing sources other than Wikipedia, or other websites). As an anthropologist, nothing quite irritates me quite as much as individuals who set up their view of marginalized peoples to be superior to others, but can't be bothered to do any sort of academic research into the relationships that they are expounding on. Do I believe that the misrepresentation of marginalized groups is wrong and should be examined from every angle? Absolutely. Do I believe that an advocate who can't spend more than five minutes conducting research before writing an article for the public, especially one advertising her academic credentials, should be completely discredited? You'd better believe it. Such a publication can only be picked apart by critics and dupes the public just as effectively as Curtis' photographs. Sioux warriors did wear head dresses into battle, called war bonnets. They would be made from collections of feathers that the warriors felt would give them power and success in battle due to the embodiment of the birds from which the feathers came from. The war bonnets would be unique to each individual, some would be passed down from father to son, and other natives would choose to wear no such war bonnet. While I do agree that if the picture was taken in 1907 it was most likely staged, this is information that you can cite in Thomas Powers' book "The Death of Crazy Horse" printed in 2010. Sorry wikipedia.